According to www.urbandictionary.com, teacher arms are defined as "Upper arms that have loose, freely swinging flab in the triceps area that hangs from the elbow to shoulder, so-called because female schoolteachers often flash said flabbiness when they wear short sleeved or sleeveless tops and then stretch out across the blackboard." Every woman dreads them, but what can we do to fix the problem? More cardio is the solution most woman try first. But excess aerobic activity is counter productive, and will only make the problem worse. Cardio will increase cortisol levels in the body, resulting in increased bodyfat accumulation in the long term. In addition, cardio will actually burn muscle. Amino acids from muscle tissue are a very underestimated fuel source during steady state aerobic work. At best you'll end up "skinny fat". So what should we do? Build muscle with weight training and let your diet burn excess body-fat without raising cortisol levels or breaking down your hard earned muscle tissue. Work out three days per week, alternating between upper and lower body workouts. Interval training can be done after upper body workouts to increase fat loss. Unless you are a competitive runner or triathlete, limit steady state aerobics to one very easy 30-60 minutes session per week, preferably outdoors. Perform two of the following exercises every upper body workout. Make sure to deeply stretch your triceps after each exercise. 1) Paused Rope Push-downs - Pause each rep for five seconds in the contracted position. Begin your first upper body workout with three sets of as many repetitions as possible, resting only 20 seconds between sets. Shoot for a total of 15-20 reps. Increase the weight when you get 20 or more reps combined on all three sets. 2) Paused Overhead DB Triceps Extension - Use a full range of motion to achieve maximum stretch at the bottom of every rep. Pause for two seconds in the stretched position on every rep. Do two sets of 20-30 repetitions at the end of your first upper body workout, resting 60 seconds between sets. Shoot for 20-30 reps and increase the weight if you get 30 reps on both sets. 3) Slow Eccentric Supine E-Z Bar Triceps Extension - lower the bar in eight seconds to aspot just behind your forehead, making sure your elbows stay pointed at the ceiling. Begin your second upper body workout with three sets of as many repetitions as possible, resting only 20 seconds between sets. Shoot for a total of 15-20 reps. Increase the weight when you get 20 or more reps combined on all three sets. 4) Paused Assisted Dips - Pause for two seconds in the stretched position. Perform two sets of 20-30 reps at the end of your second upper body workout, resting 60 seconds between sets. 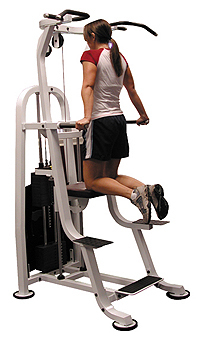 Decrease the assistance if you get 30 reps on both sets. Continue this rotation until you have completed the four different workouts six times. After eight weeks say goodbye to teacher arms forever!